The early years of Constantin Kluge’s life were unusually peripatetic. Born in Riga, Latvia on January 29, 1912, his Russian parents fled the Bolsheviks when he was only seven, emigrating to Manchuria some 4000 miles away. Kluge’s father, who was drafted into the Tsar’s army in 1914, was a successful as a member of the Army General Staff, but his sympathies for the White Russian faction during the civil war (1917-1920) proved to be a liability as the Communists gained ground. The Kluge family, now with two young sons, arrived in Harbin, Manchuria in 1920 after a protracted journey from Riga to the east. Paris in the 1930s must have been a revelation for Kluge. His knowledge of western European culture was based on his French education in Shanghai, albeit filtered through the memories of the Russian and French emigrés in his community. Perhaps the most exciting event that summer in Paris was the Exposition Coloniale Internationale in the Bois de Vincennes, a world fair showcasing France’s colonial territories around the world. Many European nations participated—Italy, Belgium, The Netherlands, Portugal—but the focus was on France’s African, Caribbean, Polynesian and Southeast Asian colonies, all of them introducing their European visitors to the architecture, customs and history of cultures they had never before seen. For Kluge, this must have felt a least a little familiar; Buddhist temples were undoubtedly rather mundane to him. The spectacular African pavilions, however, must have seemed extraordinary as well as the visiting Africans dressed in traditional clothing. As is typical of Paris, there was no shortage of protest either. The Surrealists in particular voiced their objections to what they called “the Imperialist Fair of Vincennes”, going so far as to create an alternative exposition featuring sculpture from Africa, Oceania and the Americas so that visitors could encounter the artworks without the hyperbolic exaggeration of the fair. [iii] Regardless of its colonialist rhetoric, however, the Exposition embodied a diversity that echoed Kluge’s own heterogenous experiences. He would also have encountered the avant-garde architectural community in Paris. The “esprit nouveau” (new spirit) introduced by Le Corbusier’s radically modern pavilion at the 1925 Paris Exposition had broken new ground, both technically and aesthetically, with a “new architecture” designed to serve humanity by utilizing the benefits brought about by modern industrial production. In contrast, Kluge would have been immersed in classical western culture at the École des Beaux-Arts, beginning with architecture and including the literature, painting and sculpture of ancient Greece and Rome as well. Even with his education at a French high school, much of this material would probably have been relatively new to him. Although there is little known of Kluge’s years at the École, he seems to have worked diligently at his architectural studies, graduating in November of 1937. Throughout these years, he continued to paint, putting his newfound skills as an architect to good use in creating Parisian cityscapes. He also seems to have received some portrait commissions during these years. [iv] In 1938, he returned to Shanghai after extending his stay in Paris for six months in order to focus on his painting. 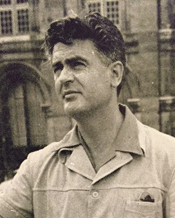 Documentation of Kluge’s life in Shanghai during World War II is limited. His architectural practice was curtailed by the war and he seems to have depended on his painting for income instead. It was during these years that he married Tania de Liphart, who gave birth to their son, Michel, in Shanghai. In 1942, Kluge also met Pierre Leroy, a Jesuit priest and biologist who was then the director of the Geobiological Institute of Peking. Both men were attending a lecture by the well known Jesuit paleontologist and philosopher, Pierre Teilhard de Chardin, co-founder with Leroy of the Geobiological Institute, and one of the archaeologists involved in the excavation of Peking Man (homo erectus pekinensis). [v] The following spring, Kluge met Teilhard de Chardin personally while he was painting the portraits of the Vichy government’s ambassador to China and his wife. The two men remained friends until the priest’s death in April of 1955. The early 1940s seem to have been both pleasant and productive for Kluge despite the political upheaval caused by war. By 1946, however, the situation changed as the Communist forces of Mao Tse Tung pressed farther south in China. Along with thousands of other refugees, Kluge and his family fled to Hong Kong where he again took up the practice of architecture. His friends Leroy and Teilhard de Chardin were forced out of China during the revolution as well, but the three men continued to correspond regardless of where they were living and working. In 1950, Kluge decided to leave Hong Kong for Paris, and at some point during this period, he and Tania de Liphart divorced. He later married Mary Regina Malcolm, the daughter of Canadian missionaries whom he may have met initially in Shanghai. He renewed contact with her in New York City when her then-husband, Neil Starr (founder of AIG) commissioned Kluge to paint her portrait. After leaving Starr, Mary relocated to Paris where she resumed her interest in painting and eventually married Kluge. [vi] The exact duration of this marriage is uncertain, but it seems to have lasted for a least a decade. Shortly after his arrival in France, Kluge made his official debut at the annual Salon as a painter. He joined the Société des Artistes Français and established himself not as an architect, but as a full-time painter. In 1961, he received a silver medal at the Salon as well as the Raymond Perreau prize awarded by the Taylor Foundation; and in 1962, he won a gold medal. 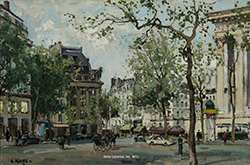 Kluge’s painting during his first decade in Paris was frequently based on street scenes and urban landmarks, but there are also paintings that suggest he was studying the work of Claude Monet and Vincent van Gogh. An undated work titled Golden Poplars is clearly based on Monet’s poplar series from the 1890s and Les pommiers from 1963 echoes van Gogh’s studies of apple trees from the 1880s. Like most artists, this exploration of past styles led Kluge to the development of his own visual style. 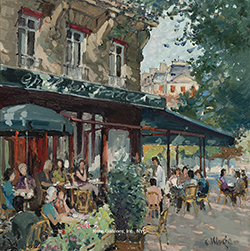 The Boulevard Montparnasse from 1960, for example, has all the freshness of Impressionism but it is integrated into a confidently drawn urban landscape of fully rendered three-dimensional buildings. Kluge had clearly created a visual vocabulary that reflected his own perspectives. 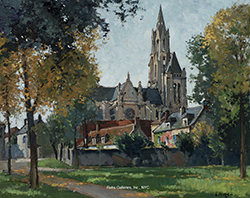 In his later years, Kluge seems to have settled contentedly into the small village of Montlognon about twenty miles northeast of Paris, where he continued his work and eventually began to write an autobiography. According to his third wife, Suzy, he was inspired to begin collecting images and stories of his life shortly after the death of a favorite cousin, the Russian writer Youri Guerman, in 1967. The book was published some twenty years later in 1987 when the painter was seventy-five years old. [viii] Throughout these years, Kluge also maintained his close friendship with Pierre Leroy who had retired to the Lycée Prive Sainte Genevieve at Versailles in 1971. Until his death in 1992, Leroy and Kluge continued to visit each other regularly. Three years after publishing his autobiography, Kluge was honored for his contribution to French culture, receiving the Legion of Honor medal from President François Mitterand at the Elysée Palace. The city of Senlis followed suit a year later, presenting Kluge with the Grand Medal of the City. Senlis is close to the village of Montlognon where Kluge was then living. [ii] Pierre Leroy Papers. Georgetown University Library Booth Family Center for Special Collections, Washington D.C.
[iii] For more information, see the well illustrated website for the exposition at: http://www.arthurchandler.com/paris-1931-exposition/ The full text of the Surrealist anti-exposition pamphlet is reproduced here as well as drawings, postcards, plans and photographs. [iv] Pierre Leroy Papers. Georgetown University Library Booth Family Center for Special Collections, Washington D.C.
[v] For a list of archival materials on Christian scholars in China, see Xiaoxin Wu, editor, Christianity in China: A Scholars’ Guide to Resources in the Libraries and Archives of the United States, Second edition (Armonk, NY and London: M.E. Sharpe, 2009). Information on sources for Constantin Kluge, Pierre Leroy and Pierre Teilhard de Chardin can be found on pp. 89-90. [vi] Ronald Shelp, Fallen Giant: The Amazing Story of Hank Greenberg and the History of AIG (Hoboken, NJ: John Wiley & Sons, Inc., 2009) Chapter 6, n.p. [vii] Kluge’s good friend, Pierre Leroy, lived in Chicago from 1950-51 while he was conducting biology research at the University of Chicago. It is tempting wonder whether Leroy’s friendship may have precipitated a visit to the city at that time, thus introduced Kluge to the city. Pierre Leroy Papers. Georgetown University Library Booth Family Center for Special Collections, Washington D.C.
[viii] The autobiography is titled Constantin Kluge (Paris, 1987). It is available at the Worcester Art Museum library and in the Georgetown University Library, Booth Family Center for Special Collections, Washington D.C. Suzy Kluge’s recollection of her husband’s motivation for writing the autobiography were published in the Montlognon quarterly journal, L’echo de Montlognon, No. 6, Janvier-Février-Mars, 2003. [ix] Quoted in Suzy Kluge, L’echo de Montlognon, No. 6, Janvier-Février-Mars, 2003. “Kluge capte la beauté parce qu'il perce l'invisible accord des choses. Il donne confiance en l'avenir de la race humaine. Il a le pouvoir de saisir l'ineffable. Cela s'appelle l'amour, cetter mystérieuse force cosmique dont chacune de ses toiles transmet l'insaisissable."